One of my Birthday presents this year (full post here) was a Mac Look In A Box set in Sun Siren. Now I will admit before this set the only things I had tried from Mac was their lipsticks and 1 of their foundations. Although its one of the big brands and every now and then they bring out stuff I want, I'm not their biggest fan. When it comes to makeup I love one brand one week and a different the next. Although thats not to say I was extremely pleased and excited to get this as I was definitely excited to try everything inside, especially their shadows as I'd been dying to try their formula. 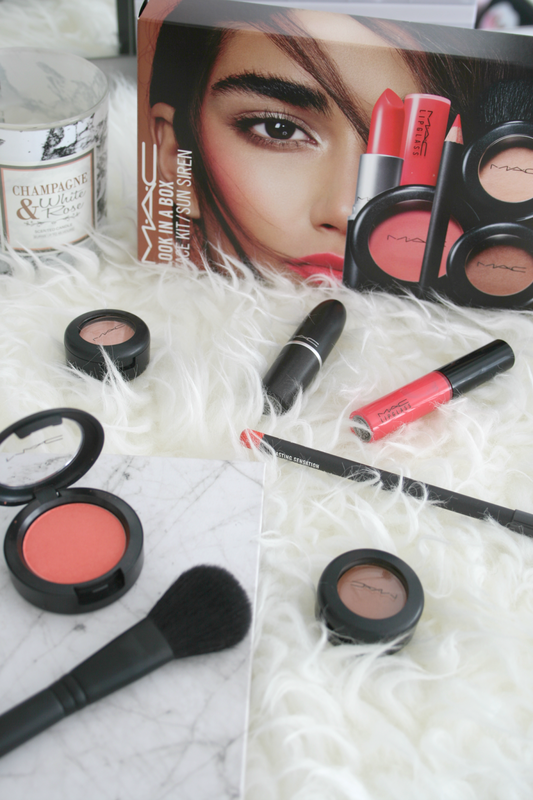 The box is a very peach toned kit, perfect for the Spring time although I can see myself using a lot of these products as we approach Autumn. Inside you receive two shadows in "Texture", a gorgeous bronzed tone with a orangey undertone that has become my new favourite crease and blending shadow, along with a pale cream shadow in "Peach on the Beach". Something I don't wear much of is Blush, I don't really know why but it's always a step I skip, however included in the kit is the Mac blush in "This is Paradise" a gorgeous coral peach shade that looks really gorgeous on the skin. Along with the shadows and blush also included is the lipglass in "Good Times", lipstick in "Vegas Volt" and lip pencil in "Lasting Sensation". They also included a mini version of the 116SE Blush Brush. I'm going to start off with the lip products first because they were what I knew best after already owning some. Starting with the lipglass. Now I absolutely cannot stand Mac glosses, their overly sticky and tacky and for such a huge worldwide brand I think they could do so much better. Including this new one I own a total of three and they are all the same and I just cannot stand them. The colour pay off is decent but the texture and formula is just terrible in my opinion. I own glosses that are much cheaper than Mac and they aren't half as sticky. I know you either love or hate the brand but I own a gloss from Kylie Cosmetics and its not half as sticky or tacky as Mac's. So this gloss will go beside the other 2 and they are the three products in my lip collection that are never really used. 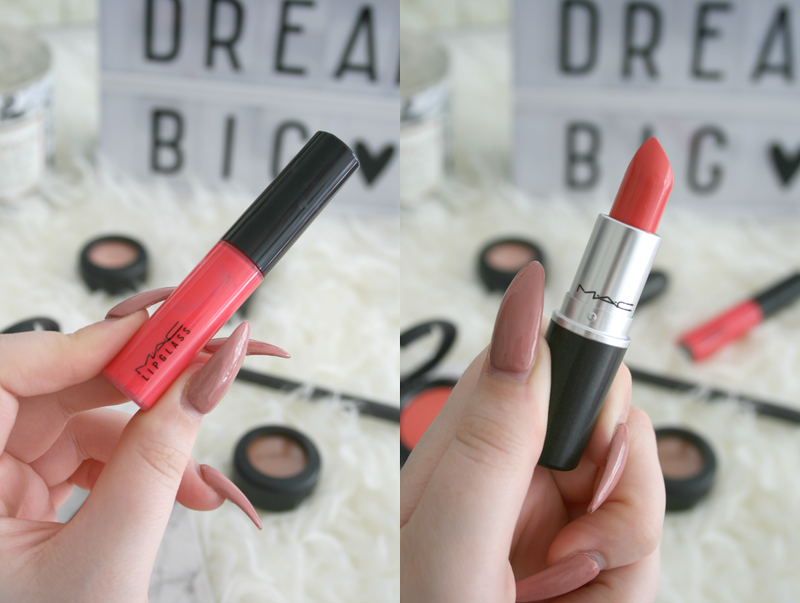 Mac lipsticks on the other hand I will say I do like them, their matte formulas I find make my lips sore after awhile because they are so drying but the shades are bomb so I just get on with it. I was so happy though that this lipstick wasn't a matte finish because out of 6 Mac lipsticks I own, 4 of them are matte and it drives me insane. The lipstick is such a perfect peachy coral shade I absolutely adore it. It's very bright and definitely not a subtle lip shade. The lipliner is my first Mac one I've owned along with it being the first one I ever tried and I must say I am impressed, it glides on so easily and doesn't drag along the skin, I could totally wear the lipliner all over the lips on it's own and it would last a few hours before having to re-apply it to freshen it up. I definitely understand the hype around the lip pencils now after trying this. 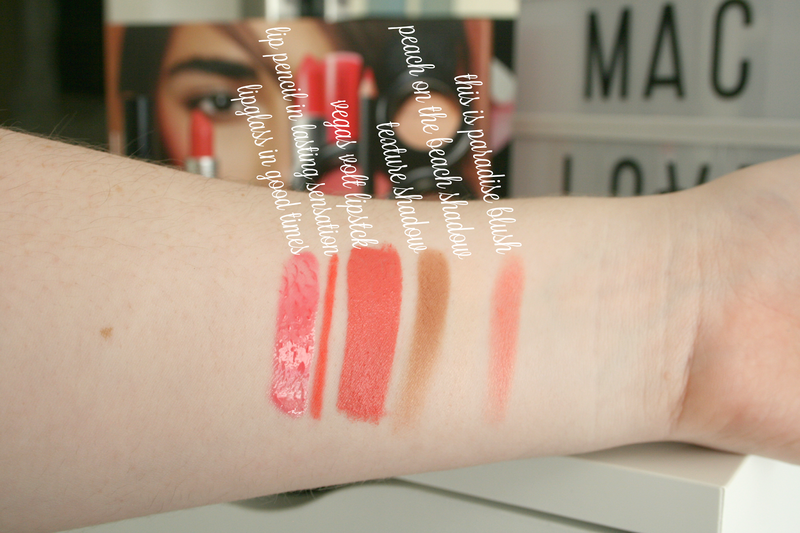 All together the three lip products complement each other perfectly as the shades are all so similar they were just made for each other. Although because of the formula of the gloss no matter how perfect the shade I just cant make myself like it, so it's a duo win for me as the lipliner and lipstick are just perfect. Onto the eyeshadows starting with Texture. I was so excited to try this because it's such a gorgeous bronze orange shade and when it's applied it just looks gorgeous. This shadow wins everything for me, the shade, the consistency, how buttery it is everything about it just wins. This is the only shadow I've been using in my crease since receiving this set. It just goes so well with blue eyes too and I find that when I wear this it exaggerates the colour of my eyes and I'm just obsessed with it. The other shade Peach On The Beach isn't getting used as much. It's a tad bit disappointing as it's so light so it doesn't really show up on my pale skin. However I have been using it running it from my brow bone to my lid to neutralise the skin so that it's all one colour for when I start applying shadows on it. It's very subtle but may show up a lot better on darker skin tones than mine. It's perfect for neutralising the eye area but other than that I don't really have much use for it. Finally the blush, now what I do find about this is you really have to build it up for colour pay off which I actually really like because I only want a hint of colour! The swatch above is the shade swatched over itself about 3 times to get the full colour pay off, and even at that I don't think it's fully showing the colour it has. I've actually quite enjoyed using this and I feel like it just adds a little bit of colour that instead of looking ridiculously pink just gives a little healthy flush of colour. Also included was a mini 116SE Blush Brush. Now when I got this I also got the ever famous 217 Blending brush and I am obsessed with it and I want to have 10 more, seriously though I can do my whole eye makeup look just using that brush. 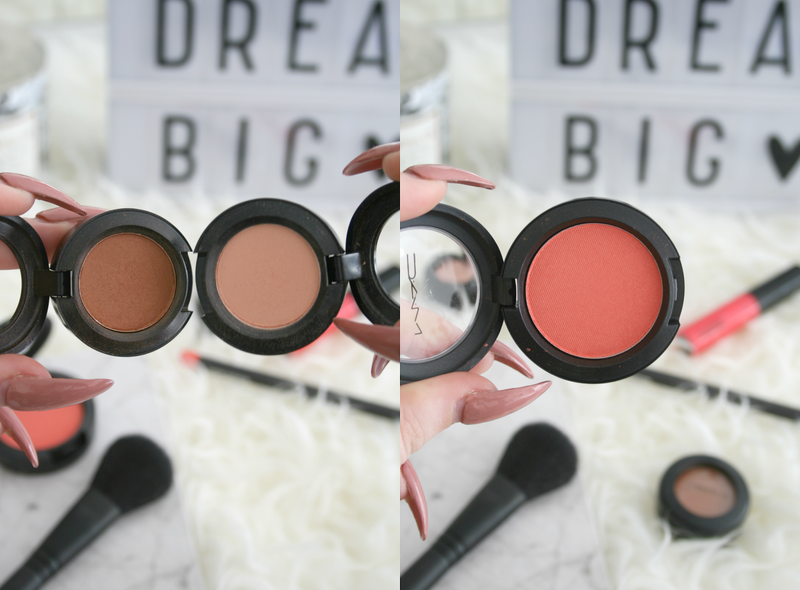 The blush brush is the first Mac face brush I own and well it's a blush brush! I have been trying it out for contouring but it gives a much harsher look than I would expect a blush brush to give. Also because it's a mini sized brush it just falls to the bottom of my brush holders and its just so annoying. I think I would have much rathered them include an eye brush because well I just think a mini blush brush is a tad pointless, but thats just me! Overall for the price (this was bought from duty free so it was slightly cheaper, there was also a staff 10% discount off so I got it even cheaper) I do think it's worth while picking up and I'm kind of gutted I didn't pick 1 other one up, but I may just have to order it now. Have you tried any of the Mac Look in a Box sets? Lovely post! I love all the peachy-ness in this set! The lipstick is absolutely beautiful.